Recently a friend shared news from her son’s preschool class about how the children are learning the “things they have in common” as a way to make friends. They explored what is the same and different about they things they like to do, their favorite memories, and the food they like the most. What is the same and different about your family members? Can your children come up with their own questions to ask the family? You’ll find out things about each other that you may not have known before asking, and you’ll be giving your child new words and ideas. 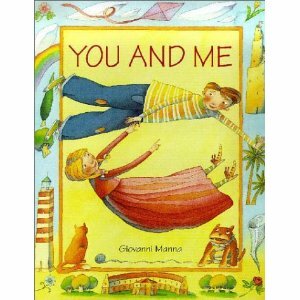 “You and Me” by Giovanni Manna. A boy and a girl are friends, but are different in so many ways. They play a game of contrasts: “I’m heavy, You’re light; You’re dark, I’m bright.” Despite all of their opposite qualities, they find some important ways they are the same. The illustrations are each framed with images that expand on the text and encourage discussion. “Elmer’s Special Day” by David McKee. Elmer doesn’t look the same as his friends. He’s a brightly colored patchwork elephant and everyone else in the herd is gray. Elmer is happy about his uniqueness, however, and on “Elmer’s Special Day” all the other elephants dress up in crazy colors and Elmer becomes gray, just for fun, to see what it is like. “Go Dog, Go!” by P.D. Eastman. This classic never gets old. “Big dog, little dog, yellow dog, blue dog.” The text is brief and the illustrations are to the point, but the story of all these dogs, with their similarities and differences, keeps children engaged and wanting to hear more. Imagine a day in your family’s life without blaming and arguing. No pouting, whimpering, or throwing a tantrum! How about a day free from grabbing, name-calling, or teasing? It’s possible! Growing up carries a certain amount of selfishness. Children have a difficult time understanding how someone else feels, and so “I want it MY way!” is often the ONLY way! Home can seem like a battle zone when disagreements heat up tempers! Creating harmony in your family can be challenging, but is always worthwhile. Start with yourself and build your household serenity by modeling how to stay calm. Sometimes it’s difficult, but take some deep breaths and listen more than you talk. Show your child that you respect his or her thoughts and feelings, even if you don’t agree with them. Explain to your child that other people may think and feel differently. The more you talk together as a family about situations and how to resolve conflicts, the better equipped your child will be when away from you. A good day to start some new family habits is on September 21, International Peace Day. This is a world-wide day for recognizing peace, beginning with children. Find ideas on how to celebrate the day at http://www.internationaldayofpeace.org. Fold an origami peace dove, make a peace pinwheel, or plant a peace rock. (Directions are on the website.) And make sure to read books together that give your child ideas on how to live a peaceful life! 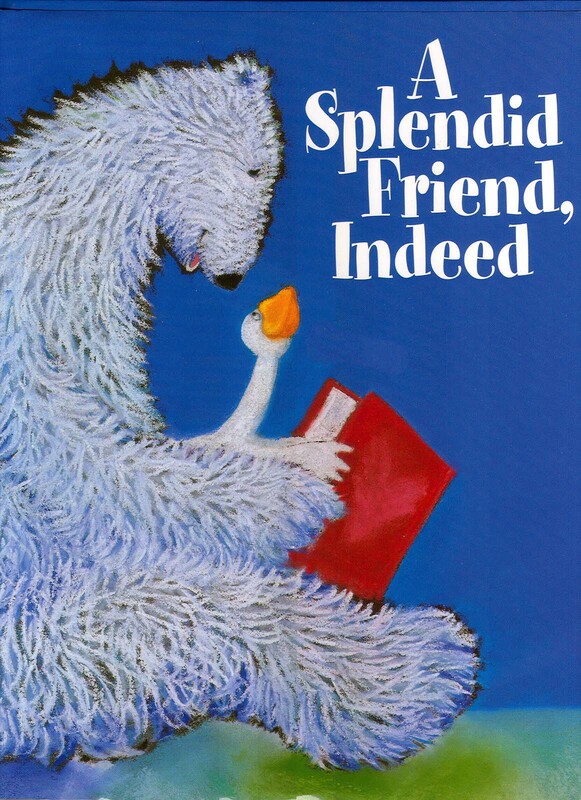 • For young children, Suzanne Bloom’s bear and goose characters overcome their differences and find ways to be friends in her books “A Splendid Friend, Indeed” and “What About Bear?” The richly colored illustrations have just a few words per page, but the story of a peaceful friendship is strong. • For older children, the classroom provides many opportunities to practice getting along with others. In “Peace Week in Miss Fox’s Class” by Eileen Spinelli, illustrated by Anne Kennedy, the students in one classroom at school all agree to spend one week being nice. No fighting or saying mean things allowed! Time after time the students forget and say rude things to each other, but in each case, they eventually remember to not jump to conclusions and to compromise. • “The Recess Queen” by Alexis O’Neill, illustrated by Laura Huliska-Beith, is a book you’ll want to read to yourself first, to see if it is one you want to share with your child. The main character, Mean Jean, is a real bully at school. She always gets her way, wins at every game, and dominates the playground. (To me, she’s a little scary!) But, the story has a great heroine, the new kid, Katie Sue. Although she is small, Katie Sue stands up to Mean Jean and even finds a way that they can be friends. It’s a “goodbye” and “hello” time of year. Children are starting school, beginning music lessons or sports practice, finding new playdates, and attending new after-school programs. There can be a little anxiety for children in all of this coming and going. And, when you know your child has “butterflies,” it can make you as a parent have your own anxiety. You can make goodbyes easier if you have a consistent routine. Leave enough time so you don’t have to rush. When saying goodbye, give a firm, loving hug and then leave, without hesitation. Be calm and show your child that you are confident that he or she will be fine. Experts say that making it clear to your child that you are leaving is much better than sneaking away. Your child needs to see that you are leaving, and be reassured that you will be coming back. When you see your child after you’ve been apart, be on time. Give another hug hello and follow through on any promises you made about what you will be doing together. When your child knows the “goodbye” and “hello” routine, and knows that he or she can count on you to come back, it will be easier to be apart. Here are some books about family love that are a warming way to spend time together when you are finally reunited after a busy day. “Daddy’s Lullaby” by Tony Bradman, illustrated by Jason Cockcroft. Daddy come homes from working the night shift and finds every in the house asleep, except his smiling baby. Illustrations are soft and dreamy watercolor. “How About a Hug?” by Nancy Carlson. There are lots of kinds of hugs–a “Good Morning” hug, an “It’ll be A-Okay” hug, a “Boy Am I Glad to See You Hug!” and the “Anytime, Anywhere, I Love You Hug! What kind of hugs does your child like best? “The Night the Moon Blew Kisses” by Lynn Manuel, illustrated by Robin Spowart. Even though this is a winter scene, it’s a beautiful book to read any time of the year. The perfectly matched text and illustrations are magically gentle. A grandma and grandchild blow kisses to the moon and the moon sends some sparkling kisses back down to them. “Hug” by Jez Alborough. 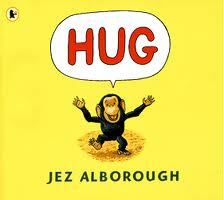 An almost wordless board book about a young chimpanzee looking for a hug. At first he is happy seeing other animals get their hugs, but eventually is sad because he wants his own. After some searching, this little guy finds his mama for a big and cuddly reunion hug. Children start to recognize different colors at about 18 months, the same time they are noticing differences in shapes, sizes, and textures. They won’t be able to say the names of colors, however, until much later, at about 30 to 36 months. Children under two will enjoy books with just pictures of objects they can recognize that are either illustrations or photographs. There may not be a story in this type of book, just images. As they get older, children can play the same “point and say” game with books that have a story line. •“Red is a Dragon: a Book of Colors” by Roseanne Thong, illustrated by Grace Lin. Saturated colors and bold patterns on each page show objects in the life of an Asian girl and her mother. The text rhymes and has a great bounce to it. A glossary of Asian terms is included in the back of book. 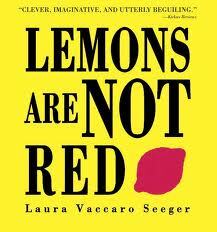 •“Lemons are Not Red” by Laura Seeger. Each page has a cutout that is the shape of an object. At first the object is the wrong color (like a red lemon) but when you turn the page, the cut out has the correct color (the lemon becomes yellow!) Clever and engaging layout and design. •“Follow Me” by Tricia Tusa. The girl in this book goes tumbling, swinging, soaring, and jumping through the colors of a landscape with the abandon of childhood. The text and watercolor illustrations are whimsical, soft, and playful. 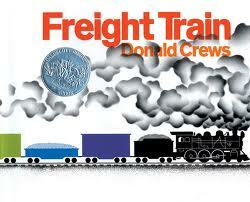 •“Freight Train” by Donald Crews. If you’ve ever wondered what each car in a freight train is called, you’ll find out in this classic book, along with the names of all the basic colors.